The MiG-21 Fishbed is the most built jet ever. Fast, small, agile dependable, and above all simple, this swept-wing MiG design ... was turned out in prodigious numbers, flooding the skies above Europe, Asia, Africa, and even Central America with literally thousands of modern, deadly fighters. It has flown in more wars than any other airplane in the world, over 10,000 of them produced by the Soviet Union, it's allies and China with a 30-year record equal, and parallel, to the McDonnell Douglas F-4 Phantom II. The MiG-21 prowess isn't its target capabilities or range. Known as a pilot's plane partially because it doesn't have any computers or fancy navigation equipment, the swept-wing Fishbed depended on the pilot's training and experience. Though this lack of technology might be termed the MiG-21's Achilles verse, it certainly shocked the Phantom pilots when it arrived in the skies over Vietnam and proved itself over and over as a formidable dogfighter against the heavier American fighters, which was another reason for the success of the MiG-21. An analog to the F-104 in that it is a Mach-2 fighter, its reliable engine, easy maintenance, rough field capabilities, and safe flight characteristic made it the most successful jet aircraft of all times. See declassified photos below. Designated YF-110, the Fishbed was flown against F-4, F-105, F-111, F-100, F-104, B-66, RF-101, RF-4 and F-5 aircraft over Groom Lake. The testing discovered that the Fishbed "has an excellent operational capability in all flight regimes. However, performance is limited below 15,000 feet due to severe airframe buffeting...." Other limitations of the Fishbed were poor forward and rearward visibility, poor gun capacity, high longitudinal control forces, excessive airspeed bleed off at high G loads, and extremely poor engine response at throttle inputs. The testing led to specific tactics for each aircraft that might face the MiG-21. For example, the F-104 "should employ high-speed, hit-and-run tactics during offensive action and avoid prolonged maneuvering engagements. 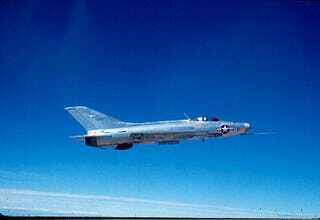 If the offensive situation deteriorates, the F-104 should separate by accelerate to above Mach .98 below 15,000 feet." Versus with the F-4, the MiG-21 had more instantaneous G available than the Phantom at any given airspeed up to the limit load factor of the aircraft. The F-111, F-105 and F-100 were suggested to avoid maneuvering against the MiG-21 that was far more agile that those U.S. planes. The complete Have Doughnut file was recently declassified, and is available for download.